Nternal Reset sublingual provides a low-dose, whole-plant, full spectrum cannabinoid profile. Nternal Reset maintains all of the cannabinoids in the plant, which results in a therapeutic remedy that is as close to juicing as a sublingual can be, infused in mild-tasting safflower oil. 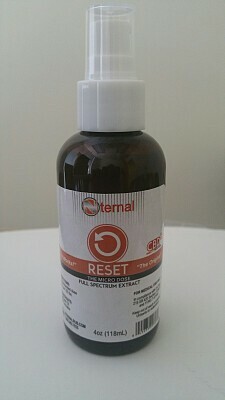 Nternal Reset is non-psychoactive, natural and fast-acting. Useful for pain relief and other beneficial regulatory effects on the body, Nternal Reset helps the body’s ability to regulate homeostasis and promotes overall well being. Insomnia relief, anti-nausea, stress and anxiety, pain, neuro-protectant for conditions such as MS, Parkinson’s and GI issues. 2 to 4 pumps Reset in the morning 2 to 4 pumps Reset in the evening At first, you may need take an additional 2-4 pumps in the mid-afternoon and/or at bedtime. It is okay to experiment to find what works best for you. Maximum suggested daily dose is 16 pumps.